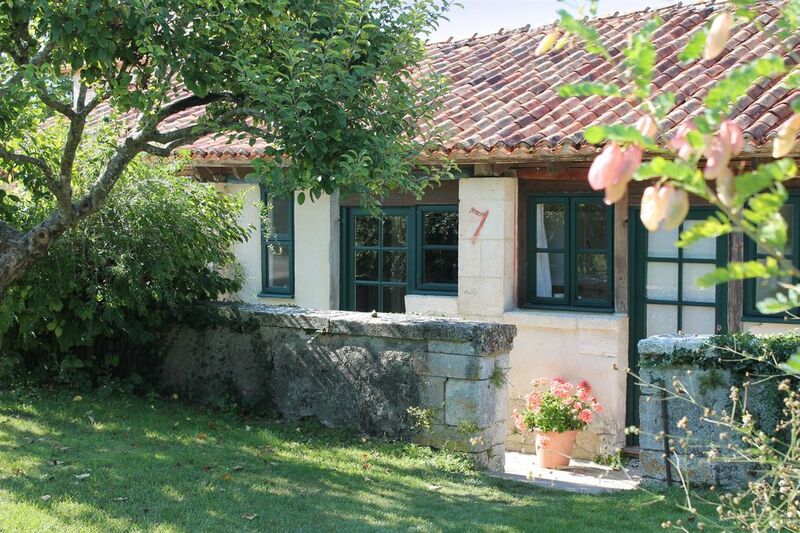 This charming little cottage is located in the back garden of the Manoir. Once upon a time it was the old chicken house for the estate, but now it has been renovated to offer modern comforts that the chickens would surely have been very proud of! A couple of stone steps lead down to a cosy open plan living and dining area with modern fitted kitchen. Double doors open out onto a rear terrace, offering views over the garden to the golf course and valley beyond. The double bedroom (which can also be made up as a twin) is located on a mezzanine floor above the living area. There is comfortable seating and dining space for four people, inside and out. The kitchen is equipped with all the utensils and tableware that you will need, including a dishwasher and washing machine. Extra equipment is often available on request, particularly for babies and children. The front of the property offers a small access terrace and a lovely spot to enjoy the morning sun. The rear terrace opens up to a shared garden with a scattering of trees and access down to the golf course. A couple sun loungers in the back garden ensure you benefit from all the afternoon sun thought to evening and sunset. Le Poulailler is a small cottage, perfect for couples, single guests, or small families. A cot can be added upstairs in the mezzanine or an additional bed downstairs, if you don’t mind a squeeze! For an independent point of view, please visit our Longeveau Trip Advisor page. Or you may also find some reviews of Le Poulailler on the Trip Advisor website itself. One Shower room with WC. The Poulailler is full of original features and offers guests beautiful views from the garden terrace. Vers slow WiFi , no 3G of 4G..
Verder kan ik als Nederlander niet zo'n lang verhaal in het Engels schrijven. A great resort, and facilities. We had a good time, the kids enjoyed it, and will likely be back. Excellent childcare / kids club. * cleanliness - it was not as clean as it might be. * general upkeep - the gite was looking a little run down. * magnetic catch to the washing machine is broken. * the walls are very thin and you can hear everything that goes on next door. * bees nest on terrace (base of wall by drain). * rather nasty smell in the gite - due I think to the wood frame - particularly manifest in the black curtain by the front door probably soaking up moisture from the wood). * air con (at least in the bar) would be welcome. * the wifi, was, I am afraid terrible. And with no 4G available that was an issue for those of us that needed to keep in touch with work. These are just niggles. You could turn a good resort in to a great one! We have a lovely holiday, and like I said, will return. I have been on holidays here countless times. The restaurant is friendly with good food and reasonably priced. The bar is also very pleasant. The tennis courts were looking a little tired but have had a new surface which has made so much difference for the better. The golf course is challenging and always entertaining. There is so much to see and do in the local areas. I cannot give this accommodation and area enough praise. I will be returning again in June. I am looking forward to it already. The Poulailler is located to the rear of the Manoir at Le Manoir de Longeveau with views across the golf course and valley beyond.